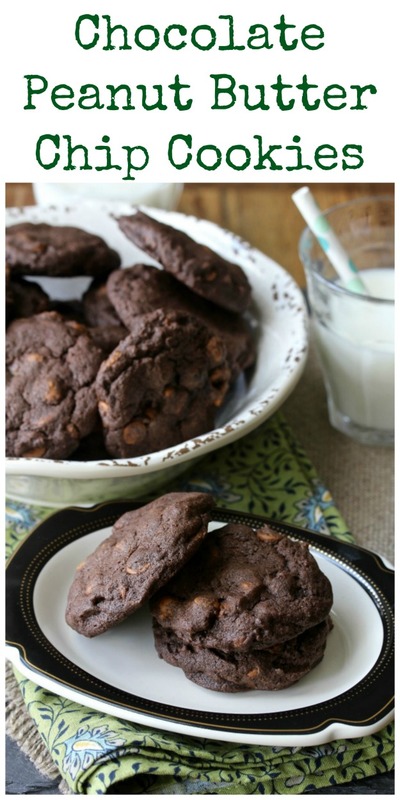 These Chocolate Peanut Butter Chip Cookies combine the flavors of cocoa and peanut butter in a delicious cookie, and then double-down with the most amazing peanut butter chips. 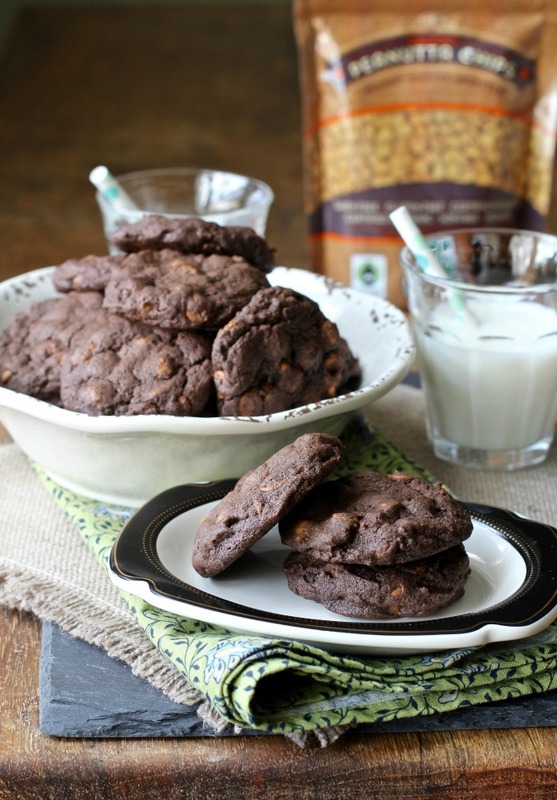 Everyone who tried one of these chocolate peanut butter chip cookies went pretty crazy over them. I took a few to work, and they quickly disappeared, and they got four thumbs up from my two grandsons (two thumbs per kid). These are pretty much a chocolate peanut butter cup in cookie form. 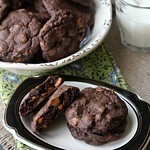 I'm really excited about the peanut butter chips that I used in these cookies. They are from Davis Chocolate, which sent me a bag to try (along with a bag of their dark chocolate cocktail sticks). I am hoping that I can find them locally, because they are killer good. Plus, they are completely organic. Disclosure: While I received product, all opinions are my own. If you can't find peanut butter chips, mini peanut butter cups found in the bulk aisle in the grocery store would work great in this recipe too. I'm also thinking that Reese's Pieces or peanut butter M&Ms would be awesome too. 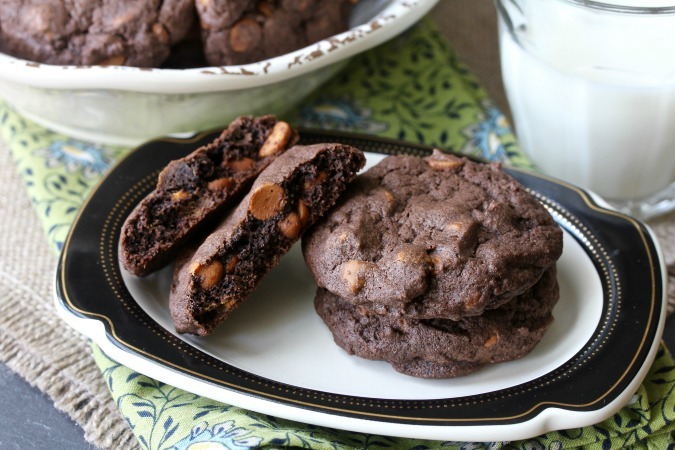 These cookies are moist, rich (almost brownie-like), and super chocolatey. 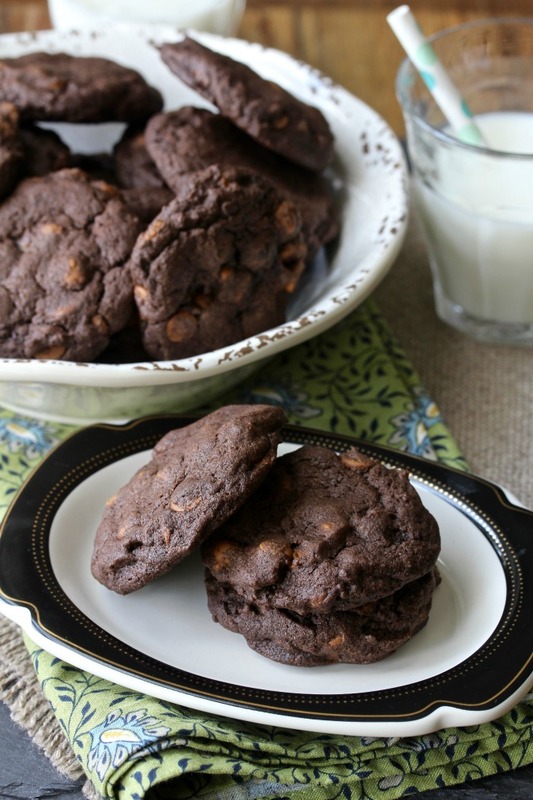 The trick with these cookies is to bake them until they are barely cooked, and no longer. They are killer good, and very peanut buttery. Today is the official start of #Choctoberfest. This is the third annual food blogger celebration of all things chocolate, made possible thanks to our gold sponsor Imperial Sugar and the other sponsors listed below. Over 70 bloggers are participating in #Choctoberfest 2017 and will be posting 200+ chocolate recipes over the next week. This prize pack is valued at over $450! To enter, simply follow participating sponsors and bloggers using the below giveaway widget. a Rafflecopter giveaway Stay tuned to see the delicious recipes bloggers have cooked up using Imperial Sugar and Barlean's products. Thank you also to Davis Chocolate and Rodelle for being #Choctoberfest shoutout sponsors! Watch Instagram and Facebook to find out more about about their chocolate products. Preheat your oven to 375 degrees F. Line two rimmed baking sheets with parchment paper. In the bowl of a stand mixer, beat together the sugars, butter, and peanut butter until light and fluffy. You can also use a hand mixer in a medium bowl. Beat in the vanilla, egg, and the water. Fold in the dry ingredients until well blended, and then fold in the peanut butter chips. Using a #40 tablespoon scoop, or a tablespoon, portion the dough onto the parchment lined baking sheets. Flatten each scooped dough mound with your fingers to 1/2 inch thick. Bake the cookies, one sheet at a time, for 7 to 9 minutes. They should be just barely set. Remove the cookies from the oven, let them cool on the pans for a couple of minutes, and then transfer to a wire rack. Thank you! Just about my favorite flavor combo. Karen these look SO good. What a match made in heaven! Yum, those cookies look amazing! It's hard to go wrong with chocolate and peanut butter! Totally. These chips were amazing.